A central objective of chemical and molecular physics is to understand molecules as quantum mechanical systems. The complex internal dynamics of such systems evolve across wide energy and time scales, exhibited by a variety of electronic, vibrational, rotational and spin degrees of freedom. Since its original discovery, the unique properties of buckminsterfullerene (C60) have attracted intense research activity. Notably, the molecule (C60+) was identified as a constituent of the enigmatic diffuse interstellar bands, which are found in the spectra of reddened starlight in space. Structurally, the unique carbon cage architecture makes them an appealing subject in medicinal chemistry to derive potential therapeutic agents. Buckminsterfullerene is cage-like with a fused ring structure (truncated icosahedron) resembling a soccer ball. Composed of 20 hexagrams and 12 pentagons (60 vertices and 32 faces), the molecule contains a carbon atom at the vertices and a covalent bond along each polygon edge. The fullerene family members are investigated across a broad range of research disciplines for their appealing physical, chemical, quantum and biological properties. For instance, the total-quantum resolved spectroscopy of isolated C60 molecules are of longstanding interest. Such observations have been difficult to obtain thus far, since C60 molecules should be prepared in cold gas phase at sufficiently high densities. 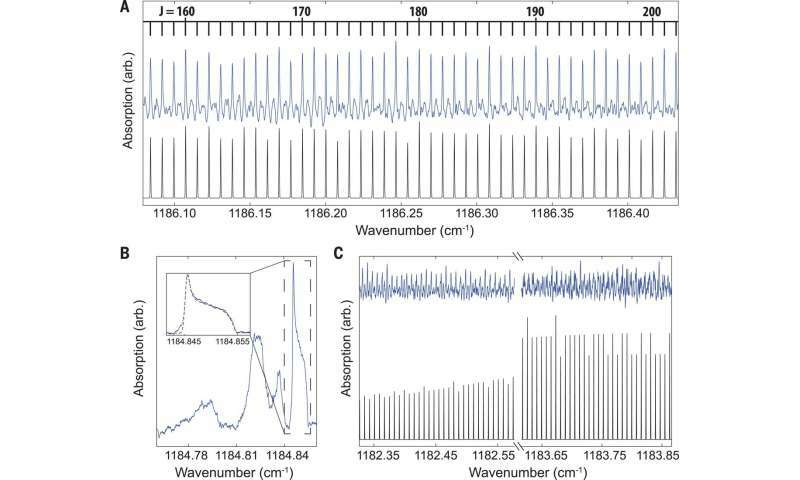 In a recent study, now published in Science, physicists Bryan Changala and colleagues report high-resolution, infrared absorption spectroscopy observations of C60 in the 8.5-micron spectral region (corresponding to 1180 to 1190 wave number). 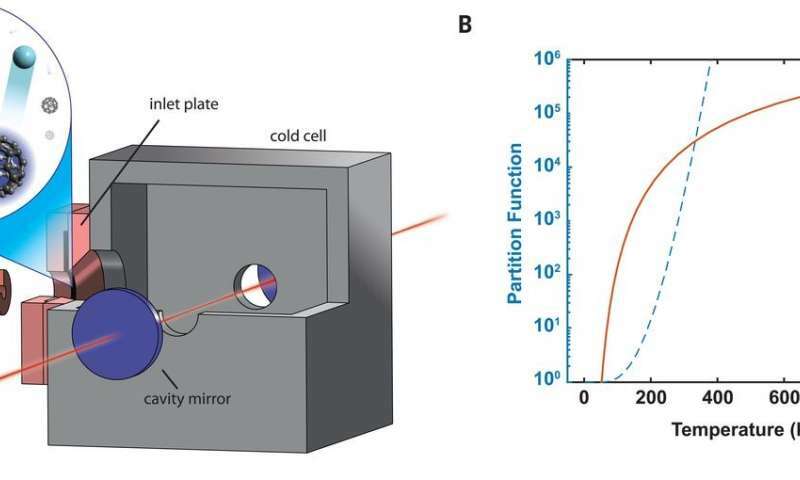 In the experiments, the team combined cryogenic buffer gas cooling and cavity-enhanced direct frequency comb spectroscopy to observe the quantum state-resolved rovibrational (rotational-vibrational) transition. Molecules usually expend more energy to vibrate than rotate, so a vibrational absorption band encompasses many concurrent rotational transitions, although they tend to blur when a molecule has more than a few atoms. Results of the study showed characteristic nuclear spin statistical intensity patterns, to confirm the indistinguishability of the 60 carbon-12 atoms. The rovibrational structures encoded further details of the molecule's rare icosahedral symmetry. Changala et al. successfully cooled C60 fullerenes to obtain the rotational resolution within a C-C stretching band. The experimental success depended on careful optimization of argon buffer gas flow. The observed quantum-state resolved features can assist characterize fullerene-type compounds in exotic environments such as interstellar space. Buckminsterfullerene C60 was discovered by Kroto et al. in 1985. Following its discovery, infrared (IR) and 13C nuclear magnetic resonance (NMR) spectroscopy confirmed its caged icosahedral structure. The scientific understanding of the molecule was further advanced via subsequent spectroscopic and analytical techniques, including x-ray and electron diffraction, Raman and neutron scattering, matrix isolation IR spectroscopy and photoelectron spectroscopy. Spectroscopy has played a key role in the astronomical detection of C60 and its derivatives. However, to date, there were no reports on the rovibrational quantum state-resolved measurements of C60 molecules. The experiments reported by Changala et al., therefore establish C60 as the largest molecule and the only example of rare icosahedral symmetry for which a complete internal quantum state-resolved spectrum has been observed. The 8-5 µm vibrational band was targeted in the study since it is the lowest-energy IR active mode in the accessible wavelength region. In the experiments, a 950 K copper oven sublimated the solid C60 samples to generate gas-phase molecules with an average internal energy of 6-8 eV per molecule. The samples populated 1026 to 1030 vibrational quantum states. The hot molecules then flowed into a cell anchored to a cryogenic cold finger, where they were thermalized via collisions with cold buffer-gas atoms introduced to the cell. 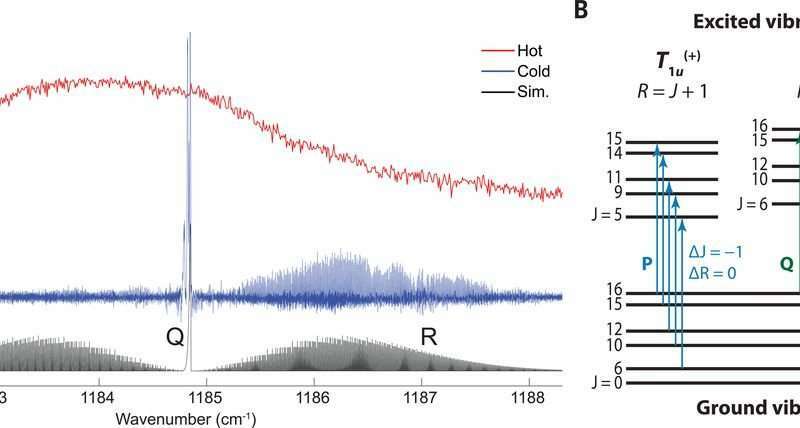 The physicists interrogated the cold-phase molecules using cavity-enhanced direct frequency comb spectroscopy (CE-DFCS) by coupling a frequency comb into a high-finesse optical cavity surrounding the cold cell to generate the long-wave IR (LWIR) frequency comb light centered near 8.5 µm. The intensity of each comb tooth transmitted through the cavity was read using a broadband scanning-arm Fourier transform interferometer. Changala and collaborators initially attempted to observe cold gas-phase C60 using low-pressure helium buffer gas conditions, similar to previous work, but could not yield a detectable absorption. The results suggested that a higher number of collisions and more efficient energy transfer per collision would be required to thermalize C60 to its ground vibrational state. As a result, a sufficiently dense, cold C60 sample was produced in the study by (1) increasing the buffer-gas mass by switching from helium to argon and (2) carefully optimizing the buffer gas flow as well as oven positioning relative to the inlet slit. The spectrum acquired at these conditions exhibited well-resolved rovibrational fine structure with narrow linewidths. Detailed views of portions of the measured IR band. (A) The R branch shows agreement between the expected intensity patterns from the simulation (black trace) and the measured spectrum (blue trace). The tie line above the spectrum indicates the lower state J value of each observed R(J) transition. (B) The Q branch region of the spectrum contains several features. The highest wavenumber feature is assigned as the Q branch of the 12C60 isotopologue. In the inset, the dashed line represents a fit to a simple quartic centrifugal distortion contour. The additional features at lower frequencies are likely due to the singly substituted 13C12C59 isotopologue. (C) These two portions of the P branch (blue trace) are representative of the disagreement with the zeroth-order simulation determined from parameters fitted to the R branch (black trace). The structure not captured by the simulation is evidence of nonscalar centrifugal distortion effects. Credit: Science, doi: 10.1126/science.aav2616. The wide spectral bandwidth of the frequency comb allowed observation between the narrow and broad signals that covered the entire breadth of the observed vibrational band. The observed fine structure in the infrared spectrum provided fundamental details of the quantum mechanical structure of C60. The energies of the states were determined by effective rotational Hamiltonians for each vibrational state. The results also indicated exceptional examples of nuclear spin statistics at work. The scientists conducted experiments to obtain detailed views of the measured IR band. When detecting R branch transitions; where the rotational quantum number in the ground state was one more than the rotational quantum number in the excited state (i.e. ∆J = +1). The expected intensity patterns from the simulation agreed with the measured spectrum. The observed patterns were a consequence of quantum mechanical indistinguishability of the perfect icosahedral arrangement of the carbon nuclei making up 12C60. In the Q branch region of the spectrum, where the rotational Q number in the ground state was similar to the rotational Q number in the excited state (i.e. ∆J = 0), the researchers observed several features. They assigned the highest wavenumber feature as the Q branch of the 12C60 isotopologue in its ground vibrational state. The remaining features in the Q branch region were not definitively assigned, but the scientists believed they were derived from the singly substituted 12C5913C isotopologue. Although the natural abundance of 13C was only 1:1%, the 60 equivalent substitution sites on the molecule lead to a notably high 12C5913C: 12C60 ratio of about 2:3. While the qualitative appearance of the measured R and Q branch was consistent with the simulation, in the P branch, the results were in substantial disagreement. The P branch is where the rotational quantum number in the ground state is one less than the rotational quantum number in the excited state (i.e. ∆J = -1). The zeroth-order simulation failed to capture the position of the number of observed transitions. This was likely since the high-order centrifugal distortion terms were not included in the simulated spectrum. The described experiments conducted by Changala and co-workers point toward an exciting direction of fullerene research, due to the broad relevance of the molecules from space to medicine. The practical applications of buffer-gas cooling introduced in the study also established the possibility of experimental repeatability in the future. Additional work can use the vibrational, electronic or other spectroscopies on larger fullerenes such as C70. Experiments can also include endofullerenes wherein an atom or molecule is encapsulated in a closed fullerene cage, or even include pure 13C60 as a pristine example of a spin-1/2 network on a spherical lattice. Chemical and molecular physics with precision spectroscopy of such targets is a first step toward single quantum state preparation, prior to experimentally controlling large molecular systems. E. K. Campbell et al. Laboratory confirmation of C60+ as the carrier of two diffuse interstellar bands, Nature (2015). DOI: 10.1038/nature14566 K.